Sleep is one of the pillars for a healthy life- mentally and physically. We spend roughly 1/3 of our life in bed, however, we are chronically sleep deprived. For many the problem is not of quantity of sleep, but also quality. Sleep disordered breathing such as sleep apnea and snoring can wreak havoc on our ability to breath during sleep and get transfer sufficient oxygen to our vital organs- including the brain. This break in our body’s equilibrium on an hourly basis throughout the night continues for years- usually going undiagnosed. Sleep apnea and snoring can increase our risk of stroke (by roughly 76%), heart disease (by roughly 50%), diabetes, depression, cancer, sexual dysfunction, acid reflux (GERD), weight gain, immune deficiency, etc. Physicians and scientists estimate that roughly 80-90% of patients with moderate-severe sleep apnea go undiagnosed. 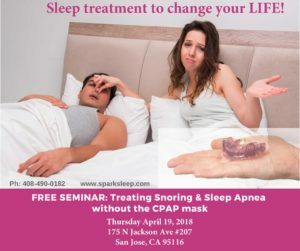 Of those being diagnosed, roughly 50% do not use the often prescribed CPAP Mask. Dr. Shah’s goal in this seminar is to share the benefit improved quality of sleep can have on your health and quality of life. He will also dive into mainstream therapy options including custom oral devices which carry a roughly 90% patient acceptance and compliance rating. Custom oral devices are considered a 1st Line treatment option for mild-moderate sleep apnea (and severe apnea for CPAP intolerant patients) by the American Academy of Sleep Medicine. Oral devices are also comparative to the CPAP in reducing cardiovascular mortality rate amongst adults with severe apnea. Our staff is excited to have you attend this seminar as the first step in changing your sleep and your life!